For this recipe, I wanted to show how changing a few ingredients and techniques in a recipe will enhance a specific beer. Using a malt forward English Pale Ale as a base for flavor building was the inspiration to this version of my Beer Brined Turkey Recipe. Firestone Walker Brewing Co. makes a wonderful Double Barrel Ale, that is perfect as a building block for turkey to be seasoned with via osmosis. To enhance the malty elements in the beer while also using the oaky flavors from the Union System fermentation, I caramelized the onions with carrots and tangerines (or oranges) with the brown sugar in making this Beer Brine Turkey (for chicken: scale to 4 servings or Cornish game hen: scale to 1 serving per hen used). Using Firestone Walker's Double Barrel Ale to flavor a Beer Brine, that seasons the turkey from the inside out. At least 2 days in advance of Thanksgiving | event | Holiday, start the brine. In a large pot, over medium high heat, add the oil and the onions. Sauté the onions for 8 - 10 minutes, until they start to brown and smell nutty. Add the carrots, thyme, sage, bay leaves and cook for another 3 - 4 minutes. Add the citrus, squeezing the juice into the pot, caramelizing the juice into the onions. Then add the citrus peels, along with the brown sugar. Continue to cook for 2 more minutes. Now add the water, salt, peppercorns and celery. Bring the liquid to a boil and simmer for 10 minutes to infuse the flavors together, dissolving the salt and sugar. 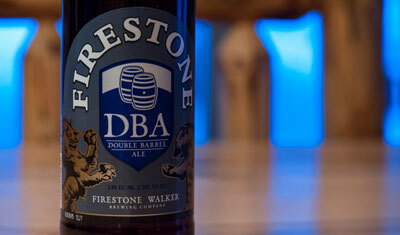 Turn off the heat and let the brine cool for 20 minutes, then add in the ice and Firestone Walker Brewing Co. 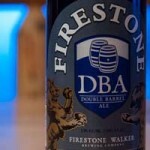 Double Barrle Ale (DBA). 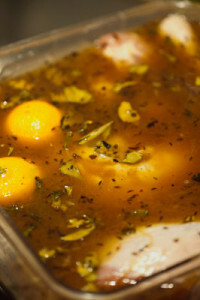 Mix the ingredients together and take the temperature of the finished brine. A thermometer should read 40°F | 4°C or lower in order to be safe to use. If it is warmer, place the pot into a refrigerator/kegerator until 40°F | 4°C is reached. 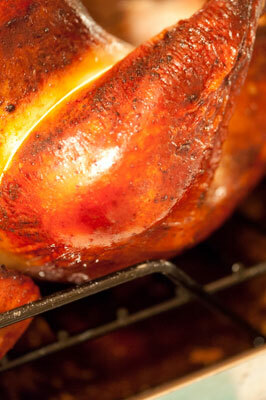 Remove the turkey from the brine and dry well with paper towels, both inside and out. Repeat this several times, to get as much of the moisture removed. This will help the browning of the skin, as moisture will steam the skin instead of roast it. 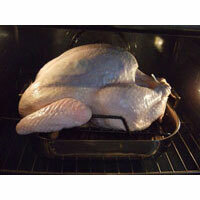 Place the turkey, back side down, in a roasting pan fitted with a rack . 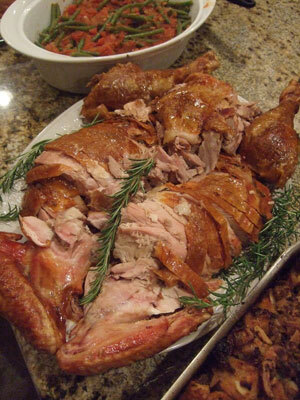 Place the bunch of sage inside the cavity, as the herbs will release their aroma into the meat as it roasts. Let the turkey sit at room temperature for 2 hours prior to being cooked. This will let the turkey warm up, allowing it to cook more evenly. 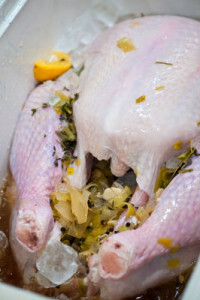 Discard the brine, as it has done its purpose and not safe to re-use. Pre-heat the oven to 350°F | 177°C, convection roast/bake if this setting is an option. Truss the bird with twine, to help hold its shape and to aid in cooking the turkey evenly. I highly recommend using a probe thermometer to make sure the turkey is cooked to a certain temperature (160°F | 71°C) verses a length of time. Insert the probe into the middle of a breast or in one of the thighs. Make sure the tip of the probe isn’t touching a bone, as the temperature reading could be false. If you don’t have a probe thermometer, a 16 - 20 pound turkey should take between 3 and 3 1/2 hours to fully cook to 160°F | 71°C. Check both the breast and the thigh temperature to make sure the turkey is evenly cooked. Other recipes describe cooking a turkey until the internal temperature reaches 180°F | 82°C and this is one reason for a dry turkey. 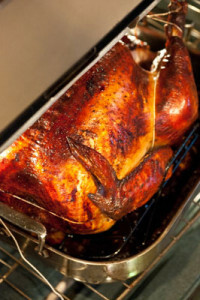 Turkey is safe to eat after it reaches 165°F | 74°C. It's fine to remove the turkey from the oven at 160°F | 71°C, as the heat of the oven and the surface temperature is higher than the internal temperature. As the turkey rests, the carryover heat will finish cooking the turkey and bring it to a safe final cooking temperature of 165°F | 74°C.